Recently, some of my closest friends – truly non-blood family – welcomed a new bundle of joy into their lives. To say she’s precious and perfect is an understatement. She’s all that and so much more, and I can’t wait to spoil her rotten as is the right of any “uncle” on the planet. Her father was talking about how they’ve been preparing their dog for the baby’s arrival, and I think this is some useful information to pass along to all dog parents. So, I hope you enjoy this post helpful. Happy reading! Anticipate the changes to your dog’s daily schedule – Dogs are creatures of habit. They like their routines. If you know the location of your dog’s bed is going to change when baby arrives, make the change before the arrival. If you know your pet’s exercise schedule will be altered (and let’s face it, it will be! ), make those modifications early. Why do these things? 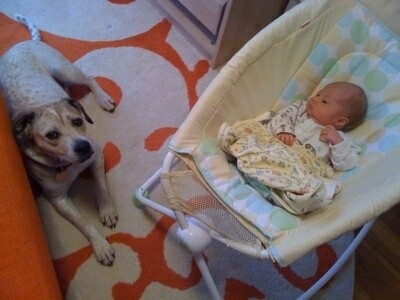 You don’t want your dog to associate changes in routine with the baby! Initiate these lifestyle modifications 2-3 weeks before the baby’s due date. Ease up on the attention – Many pet parents recognize their dog is not going to get as much attention – at least for a little bit – once a new little one arrives. So, they try to compensate by lavishing them with extra attention for the birth. While such a move is logical, it actually may create jealousy. Introduce typical baby stimuli – Babies smell. They make a lot noise. All of these new stimuli can be overwhelming to dogs. So, to help introduce them, use baby lotion and baby powder in your home prior to the baby’s arrival. 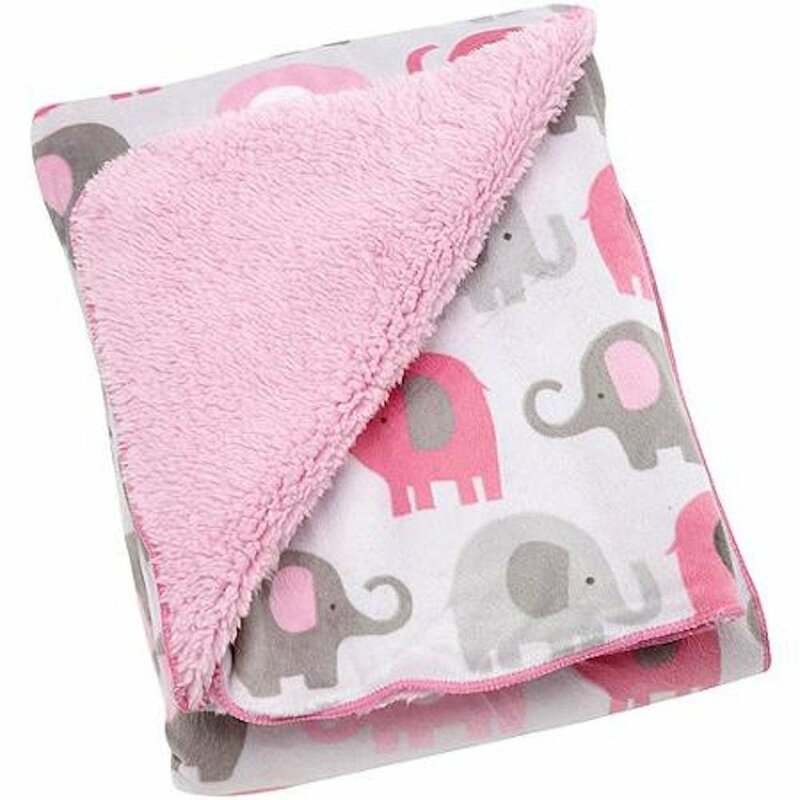 Once the baby is born and before you come home from the hospital, bring one of the baby’s hats and/or blankets to your house so your dog begins to get used to the true scent of your newborn. You could even record your baby’s mumblings and crying while at the hospital and subsequently play the recording at home to help the dog acclimate to the new sounds it will undoubtedly hear for many years to come! Allowing your dog to smell blankets and hats used by your newborn can help promote a smooth introduction. Greet your dog alone – Your dog will be excited to see since you’ve likely been gone for a couple of days. Vocalizing, barking, and jumping will likely ensue. To avoid accidentally injuring your newborn, say hello to your canine friend away from your new child, allow your dog to express excitement and ultimately calm down before meeting their new family member. Create a safe zone for your dog – Bringing a new baby into your home will undoubtedly be a stressor – at least initially – for your canine companion. In stressful situations, we all need a place to get away from the chaos. This holds true for dogs too, so make sure your dog their own place in your home to get away and be alone. This safe zone becomes exceptionally important as babies become mobile, as there is the potential for tail and ear pulls. It goes without saying children should not be allowed in your dog’s private space! 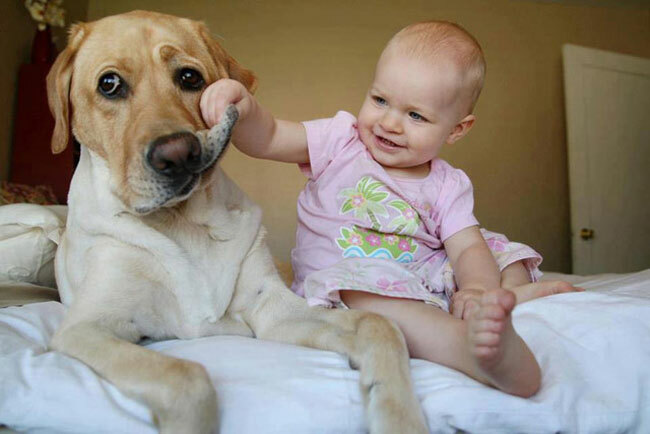 Look at the dog’s face! Pets need a safe zone in your home to get away from children. 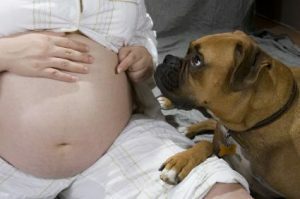 Don’t ignore your dog when the baby is around – Time management is challenging for any new parent. One of the challenges of pet owners with a new baby is to ensure dogs aren’t forgotten. They still need and want attention. One mistake many new parents make is to only lavish attention on their pets when the baby is not around. This approach could give the dog the impression only could things have for them when the baby isn’t around – in other words, they could perceive the baby as the reason they don’t get attention, and we don’t want to create that association. No scolding when it comes to toys – Dogs like toys. They don’t know if a plaything is theirs or a baby’s. Furthermore, baby toys smell very interesting, piquing the natural curiosity of pets. If a dog picks up your baby’s toy, don’t panic. You don’t want to create a negative association with the baby through an over-reaction. Simply, replace the baby’s toy with one of the dog’s toys. Then, appropriately clean the baby’s toy before giving it to your kid. Finally, under no circumstances should your dog ever be left alone with an infant or small child. Never! I don’t care if the dog is your most trusted companion on the planet. Do not leave them alone with your baby. Just don’t do it! Never leave your pet – even the “best trained” one – alone with your baby. Beginning a family is always an exciting new adventure for parents. Fur kids pose some unique challenges when new kids are introduced to a home. With some common sense approaches to baby introduction and household management, parents can successfully introduce their new little human into their pet-filled home. To find a board-certified veterinary behavior specialist, please visit the American College of Veterinary Behaviorists.